Previous research by Jisc (http://repository.jisc.ac.uk/6562/) investigated the unavailability of reading list materials in a digital form for use in higher education. Following on from this initial research, Information Power undertook a detailed investigation into the underlying access issues and potential routes to improving provision of reading list materials in a digital form. Following consultation with stakeholders, including acquisition librarians and publishers, the report identified disconnects in understanding as to the issues being felt by each of the parties in the supply chain, offering a series of recommendations to potentially alleviate those concerns. Posted by Karen Colbron on August 21, 2018 in monographs. Information Power Ltd (IPL) is currently working on a Jisc project examining the problems that libraries face in finding and acquiring e-books for titles on reading lists. The project will take these findings to the publishers’ associations to facilitate a discussion about how publishers can address the problems and meet the needs of their library customers. Discoverability: It is often difficult for libraries to discover if an e-book version is available at all due to metadata issues and patchy distribution via the various aggregator platforms. Acquisition: When e-books versions are available, the acquisition model is not always suitable for library use. For example, non-perpetual licences, titles that are only available as part of a package or access models that are too restrictive. To help inform this discussions with publishers, we would be grateful if you would take 10 minutes to complete this short survey. The first part deals with the issues of discoverability, and the second part asks you to rank criteria in the levels of importance for library acquisition of e-books. Measuring the level of importance will provide critical information in the discussions with publishers. We would be grateful for your feedback by the end of May. Posted by Karen Colbron on May 15, 2017 in monographs. Posted by Neil Grindley on February 2, 2017 in monographs. Throughout 2016 we worked with participants from the Access Solutions pilot to identify issues around what was initially labelled as a ‘monographs’ in a digital form, however bibliographic information supplied on reading lists, by academics and researchers often made it difficult to distinguish titles this way. The ten chosen institutions supplied us with lists of titles they required, but were not available as e-books or useable to them in their current e-book status, indicating the nature of the problem based on pre-defined categories. We also asked for the reason for the need (reading list, research, preservation or ‘other’ such as accessibility) and an initial idea of the sort of use they required (on-campus only, remote access, for single users or multiple concurrent users). The titles reflect the precise year and edition requested by their users. We carried out a series of follow-on workshops to further articulate access issues and undertook research to assess the level of effort to accurately define the most current information available for the sample dataset of titles. 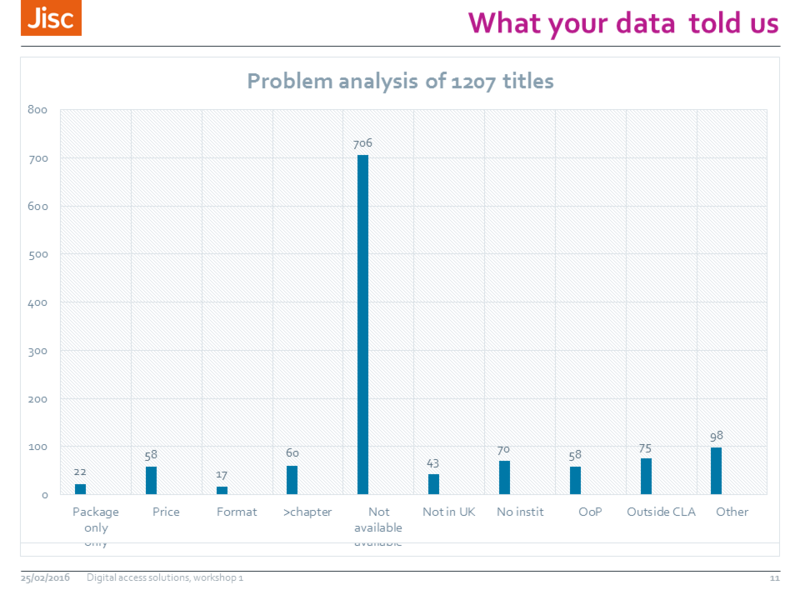 The project produced over 1000 titles and, while the data set is based on the requirements of a relatively small number of UK HEIs, it presents strong indications of the underlying problems around access to books in digital form. 80% of the sample titles gathered from 10 HEIs participating in the Jisc Digital access pilot study are for reading list use, and 78% of these titles are not available as e-books. 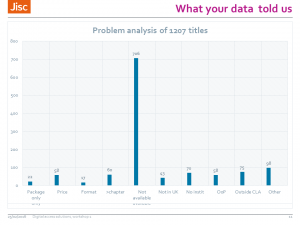 The sample data points to 41% of titles being held by ten publishers taking their imprints into account. A higher percentage (44%) constitute a long-tail of publishing houses controlling ten or fewer titles, with the majority holding one title only in the sample set. This indicative data and the case studies supplied by the participating HEIs has suggested possible access solutions. The next phase of the project will work with strategic stakeholders to validate and prioritise the use cases addressed in the report as a preamble to working with publishers on scenarios to potentially increase access to academic books in a digital form. Posted by Karen Colbron on January 18, 2017 in Digital access, Final Report, monographs, Solutions and tagged Digital access, monographs, Problem statements, Solution ideas. Jisc has been working very closely with representatives from the academic library sector (and in particular RLUK, SCONUL and the British Library) to refine and articulate requirements for a new large scale national service. The proposed title of the service is the National Bibliographic Knowledgebase (or NBK for short). This is essentially the Knowledgebase that the National Monograph Strategy Roadmap set out as its first and most significant recommendation and which will be the foundation upon which a number of important functions and activities will depend. 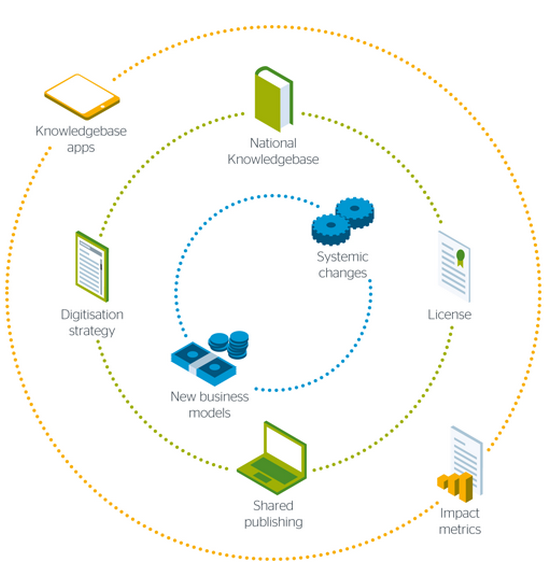 The data underpinning the Knowledgebase will rely – on the first instance – on libraries of all types allowing their bibliographic and holdings data to be aggregated by a designated service provider into a single system that is capable of working at greater scale and ingesting more diverse library data at much faster rates than is currently the case with the Jisc Copac service. I’ve been taking every opportunity I can to set out the high level plans for the new service and one of the recent conferences I presented at was the SCONUL 2016 conference in Cardiff. I showed a presentation called SCONUL 2016- Building the Case which graphically and textually describes the objectives and the scope of the service; sets out the problems we are aiming to tackle; and finishes by suggesting some value proposition thought experiments and some sustainability ideas. It’s important to note though that this initiative is now into an active procurement phase where Jisc is in dialogue with short-listed suppliers to negotiate and clarify how the NBK will be created and delivered for the benefit of UK academic and specialist libraries and their users. The schedule is ambitious – both for selecting and contracting a supplier to build the NBK (in place by November 2016); and for delivering a richly functioned production-level service with integrated data sources (by November 2018). Most important of all, however, is to underline that the building of this system must be a shared community endeavour rather than something that Jisc simply attempts to procure and deliver at a reasonable cost to whoever is interested at the point of use. We are working closely with RLUK, SCONUL, the British Library, individual representatives from academic libraries, with publishers, licensing organisations, and service providers to try and really think through how to realise transformational change. That change must involve improving the quality and comprehensiveness of information across the bibliographic data ecosystem; but must also involve more effective and efficient access to e-books and digital surrogates of print books. Those interested in both strands of work might find the recent presentation at the LIBER conference of interest (LIBER 2016 BD-NMS_PM_NG_FINAL) which features analysis and results from our digital access pilot project. Fingers crossed that we emerge in early November with a solid specification and a strong plan for building the type of data foundation that supports emerging and evolving ideas around a National Digital Library. Posted by Neil Grindley on July 18, 2016 in collection management, monographs, NBK, Phase 2, RLUK, SCONUL. So what’s the problem with e-books? We’ve had some very interesting conversations over the last couple of weeks with librarians about e-books, at Digifest and at the day-long workshop we held for project participants. We feel your pain! The e-book market is in its infancy compared to print, so it probably isn’t all that surprising that there is still turbulence and some attempted solutions likely to die out, just as in evolutionary biology. The academic books market is also a little different than the trade book or general fiction market where most progress to date has occurred. Academic books often contain tricky things like tables and figures, mathematical notation and references, that some e-formats just don’t display comfortably. Unsure of the best fix, publishers and aggregators are trying out different business models, different formats and platforms, and imposing a host of different sets of licence terms and conditions to see which work for you and them. But that causes headaches for those trying to present their patrons with a coherent collection. Meanwhile, students and lecturers are getting frustrated because they need access to the content sooner not later. How the library manages these things is of no interest to them. We’ve collected over 1200 titles identified by librarians as problematic for them in some way, and started to work on the data. Simply not being able to find out about e-book versions emerged as the biggest problem, and conversations since have confirmed this as a top priority. We’re working on finding out more about these titles, since the reasons behind not being able to find them as e-books vary. When we have a bit more to go on, we’ll be able to start discussing possible solutions to some of the problems. We’ve also found that although libraries have different preferred business models (credits, rentals, EBP, PDA) they’d much prefer it if they could buy outright at a reasonable price. In-library access only is almost universally considered useless, because students want to work at times and in places to suit them, not the library’s opening hours. And with geographically-split campuses and distance-learning becoming more widespread, remote access is important for librarians and patrons alike. For most libraries, access to monographs is to fulfil requests for reading lists. That doesn’t mean research requests, space-saving, preservation or collection-building is unimportant, just that having material for students to access for their courses is the strategic priority. I’m not sure publishers have woken up to the rise of student satisfaction scores when they think about this type of content, and how libraries need to be able to make it available more widely. There must be some opportunities where a need exists. Posted by Vivien Ward on March 14, 2016 in monographs. Thanks to everyone who responded to our call for participation last month. We had a large number of applications from libraries interested to take part, 20 in all, so we had to select between them. We’ve tried to take a wide range of different types of HEI, with differing priorities, sizes, student populations and missions. This is to try to ensure that we get as representative a sample as possible for our project so we have a feel for what the sector needs in the longer term. The unsuccessful applications are being held, as there was a wealth of great data and opinions in them. We hope we can make use of what you’ve told us either later in the wider project, or perhaps in other work being carried out in Jisc. There’s still an opportunity to contribute your knowledge and opinions, even if you weren’t able to answer the CFP. I’m running a workshop on the topic at Digifest and would love to meet you and hear about your experiences with monograph content and digital access. Data gathered from this workshop will be added to what we have already, along with the detailed information gathered as the project progresses. Later this year, as a result of the work done on this section of the project, we aim to have a pilot test in place open to all UK universities. So even if you’ve been unable to contribute yet, and can’t make it to Digifest, your input can still be counted. Posted by Vivien Ward on February 5, 2016 in monographs. Don’t forget to send in your application to participate in the pilot work that aims to find new new solutions to the problems of accessing book content in digital formats by Friday next! See the previous post (Investigating access barriers…….) for all the details and application form. Posted by Vivien Ward on January 5, 2016 in monographs. 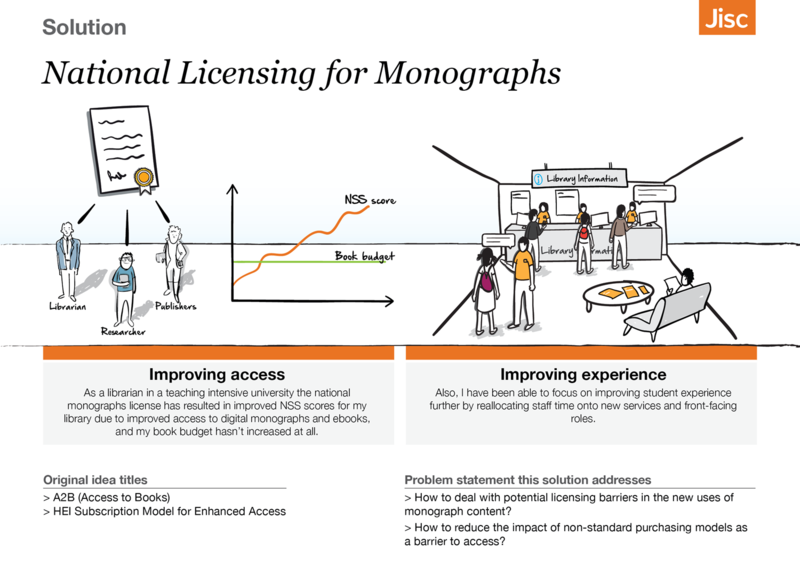 This call for Participation invites librarians in Higher Education institutions to join Jisc as we work through issues relating to access to digital monographs as part of the second phase of the National Monographs Strategy project. Jisc will award grants of £6,000 to up to ten HEIs to cover participation in the project by two library members of staff, one with strategic oversight of collection management issues, and the other with responsibility for the implementation of day-to-day collection management policies. Find out more, and how to apply, by following the link below. The National Monograph Strategy outlines a future scenario where “within 5 years UK researchers and students will have unparalleled access to a distributed national research collection enabled by an open collaborative national infrastructure.” Work is being planned now to address a number of the areas of the RLUK/SCONUL/Jisc co-design initiative that was set forth last year. One of the areas we are working on is an investigation of ways of providing access to digital monographs. This involves developing actual use cases and examples of real book titles for a test of proposed new workflows that would facilitate wider digital access to book content so that we can design an effective pilot project to tackle those areas with the greatest need. Linked to this, work is also underway on ways of providing better information about the availability and rights statuses of book titles. The data and use cases from the libraries participating in the project will inform the creation of a rights portal and feed into user requirements. Jisc is seeking the support and input of librarians from a range of different HEIs to help shape this phase of the work. It is anticipated that participating libraries will engage with the project through a short set of workshops and webinars, as well as providing a list of titles libraries have difficulties in accessing in digital format and the obstacles to access. Posted by Karen Colbron on November 23, 2015 in monographs and tagged Digital access, monographs. The Summer is now (long) gone and we find ourselves in a new phase of work in relation to following up the recommendations of the National Monograph Strategy (NMS). Working closely with RLUK and SCONUL we’ve had a lot of discussion with a variety of stakeholders, including librarians, publishers, collecting agencies, service providers. We now need to move decisively to implement solutions in the area of monographs (as well as other types of academic books). To reflect this, we have changed the title of this blog (and have also taken the opportunity to apply the prevailing Jisc branding). We want to keep the connection going with all of the valuable work that was done under the banner of the NMS and so the content of this blog will continue to feature all the posts that set out the wide-ranging discussion that got us to the present point. So in that sense, (as the previous post claims) the NMS is still ‘alive and well’. However, there is now less need to reference the overarching strategy and the Roadmap and more urgency to design and implement specific user and customer-led solutions. We have convened a group to steer and oversee another phase of work and the name of the group indicates the provenance of the discussion that brought it into being. The Bibliographic Data Oversight Group (BIBDOG) has a core initial membership featuring representatives from Jisc, the British Library, RLUK and SCONUL. The formation of this group was one of the key recommendations from a recent Jisc-commissioned report that has helped to define next steps, particularly in relation to the development of a ‘Monobase’ which was a central concept of the NMS. There is a two page summary of the report with some reflections and next proposed steps. The core BIBDOG group will be discussing the scope of its role and the ideal shape of its membership but it seems likely that it will be the governance and steering mechanism for pursuing the sorts of solutions that the NMS proposed. Posted by Neil Grindley on November 20, 2015 in monographs. The NMS is alive and well! The previous post on this blog was by Ben Showers last October and given that there has been no activity here for the last 9 months, you could be forgiven for thinking that the National Monograph Strategy Roadmap must have ended up (unloved) on a dusty Jisc shelf. Ben waved farewell to Jisc last November and is now doing exciting things in the vicinity of Whitehall. What he left behind, however, was not a dusty old report that no-one at Jisc looks at any more. Quite the contrary in fact. Not only do some of us look at it quite regularly to remind ourselves of the specific recommendations it makes in a number of areas; but we also look at it because it is the culmination of a very thorough community consultation exercise. It synthesises the discussion of a large group of experts and it is a document that helps us to keep thinking hard and clearly about the best way of tackling the range of challenges that researchers, libraries, institutions, publishers and vendors continue to face in relation to monographs. My name is Neil Grindley and I’m the Head of Resource Discovery at Jisc. I now have responsibility for thinking about how Jisc should address the questions that the NMS poses and to work with strategic partners and practitioner groups. I’ve restarted using this blog because I think we need – above all – to be clear about who is planning on doing what in this space; how far they have got with it; and conversely … who doesn’t need to do stuff. I say that because two things have become more and more obvious to me over the last 9 months as I have been trying to work out what the practical implications are for implementing the NMS Roadmap. The first is mostly because of the second. So, we’re going to try and keep people informed about what Jisc is up to as we continue to follow up the NMS work. That might hopefully give others a better chance of working out what they want (or need) to do; or indeed how we might work together to solve some pretty big problems. I will resist the urge to try and say too much in my first NMS post. There are some upcoming opportunities to discuss the NMS and related work. If you aren’t there in person you might catch something on twitter. Feel free to follow me @neilgrindley. 21 July 2015 – Copac Bibliographic Services Review Workshop – A request for practitioner input. (If you act quickly you may still be able to participate by sending an email to david.kay@sero.co.uk). 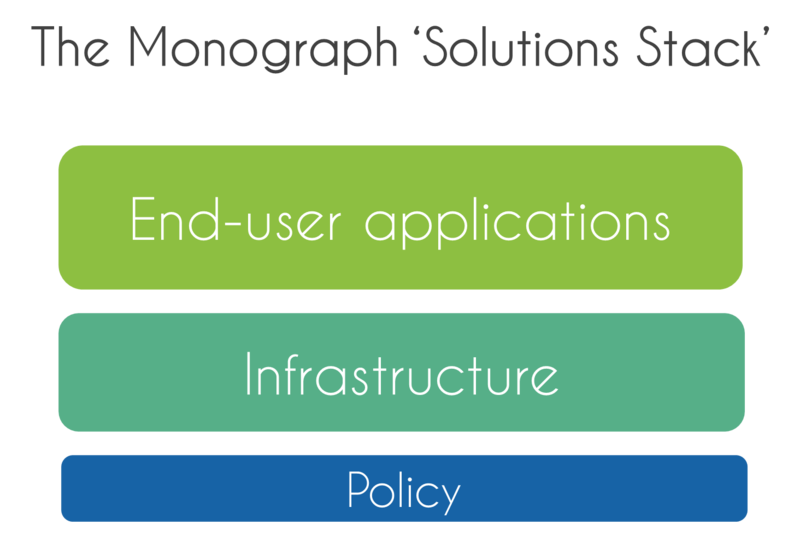 Posted by Neil Grindley on July 4, 2015 in monographs, Overview, Phase 2, Solutions. You wait for ages and then, suddenly, monographs are everywhere! A post by Melissa Terras on the Guardian HE blog, arguing that if you want to be taken seriously as a scholar in the humanities you need to publish a monograph. The monograph really does seem to be having its moment in the spotlight. But that’s not all. 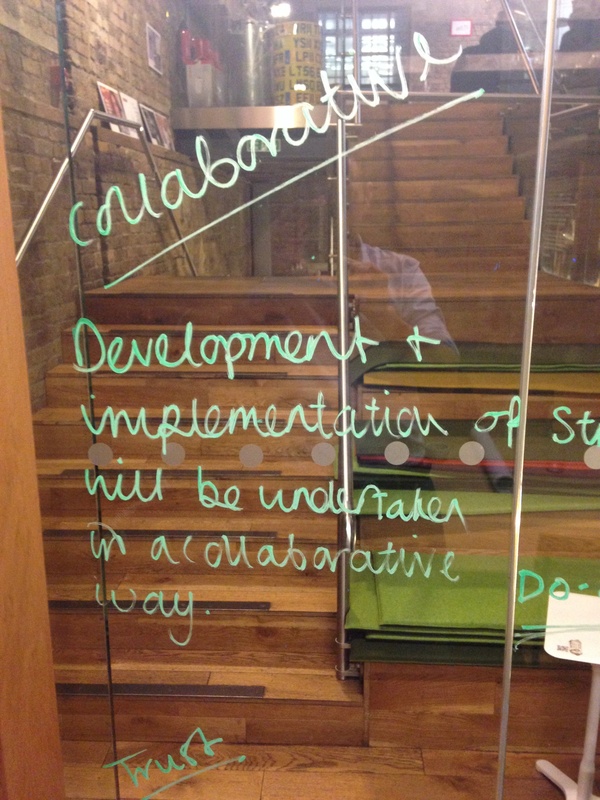 I also spotted two stories about collaborative shared storage and deposit services. In the age of learning commons and makerspaces, many of them now find that high-density shelving can no longer be restricted to older or less-used materials. Some send substantial numbers of newly acquired volumes directly to an offsite facility, often because they are relatively arcane materials that are still of value to the research collection. This announcement describes the Five College Consortium’s plans in the US to begin construction of a 2.5-million-volume library annex that will provide shelving to supplement the capacities of the on-campus libraries. These are interesting in the context of the monograph strategy. While space was one of the priority challenges institutions highlighted, the answers proposed tended not to focus on building more local or shared space and/or storage. While space was a problem, more space wasn’t necessarily seen as the solution. Instead, much of the focus was on the ability to use data to enable institutions and their libraries to make more informed local decisions locally. The storage effectively gets spread across the libraries themselves. The ideas from NMS were focused more on developing a national collection – and strategy – which could help alleviate some of the pressure locally, while building a national research collection. Of course, access still has to be provided to the books that are held in other libraries. And additional space may be needed. But, the community didn’t start at space. It doesn’t see space as the only answer, or more space, or more… and more. Posted by Ben Showers on October 7, 2014 in collection management, monographs, Shared storage and tagged monographs, Shared print services, Shared storage. Yesterday the National Monograph Strategy Roadmap was published on the Jisc website. You can find out more about the roadmap and the ideas in the Jisc blog post that accompanies the report. In this post I want to briefly explore some of the things that have been happening while the report was waiting to be published. The roadmap marks the beginning of the real work of the strategy: Working with the community to explore, develop and implement the various ideas that emerged from the first phase of the project. Of course, one of the mantras of the NMS has been that the strategy will be a set of doable, pragmatic and collaborative solutions that the various communities interested and working in this space can work together on. This is not a strategy that sits on a shelf unread; its a strategy that attempts to sign post the possible ways forward for addressing the challenges faced by the scholarly monograph. Funding of a project to build on the Copac Collections Management Tool to develop the project into a national service, and explore its potential as the monographs knowledgebase. Work will begin in October 2014 for approx., 12 months with community engagement via the CCM community/steering group. Establishment of a small steering group to explore the potential of a UK shared print service, building on the monographs knowledgebase. This group of library directors, British Library, SCONUL, RLUK and Jisc met in early September and have agreed a number of next steps, including a shared print service pilot focusing on copyright/national library collections. SCONUL, RLUK and Jisc will be developing the plan and proposal for this work over the next couple of months, with an aim for the project to start in late 2014/early 2015. Drafting an invitation to tender for a landscape, requirements and options analysis for the development of a shared publishing platform for UK higher and further education institutions. This is likely to begin in late Nov. 2014 and complete in Feb. 2015. It is also likely to tie in with wider sector interest and initiatives, such as OAPEN. These are the priority areas being taken forward currently. However, over the next couple of months work will begin on scoping a national monographs license, and the progression of the other core ideas of the strategy. If you are interested in any of these, or would like to find out how you can get involved, feel free to drop me a line or leave a comment at the bottom of this post. Posted by Ben Showers on October 1, 2014 in Uncategorized. It’s all been very quiet on the blog – but things have been happening. I mentioned in the last post that the project had drafted the strategy report structure and contents with SCONUL and RLUK colleagues. The report is now at the point where we are very close to being able to publish it – This should be within the next couple of weeks. The report will be published as a web page on the Jisc site, along with a post on the Jisc blog to provide a little more background and context. We will also link to the report from this blog as well. This should help ensure we’re able to capture any comments or feedback people have that they may not want to leave on the Jisc blog. The publication of the report will enable the project to begin kicking-off the second phase of work in earnest and documenting that here. So, over the next few weeks keep your eyes peeled for news of the strategy. Then, following that, we’ll begin to post further details of the second phase of work and how you can get involved if you’re interested. Posted by Ben Showers on September 9, 2014 in Final Report, monographs. To what extent does the physical environment in which we undertake a task (hold a meeting, run a workshop, write a paper), affect the outcome of that activity? 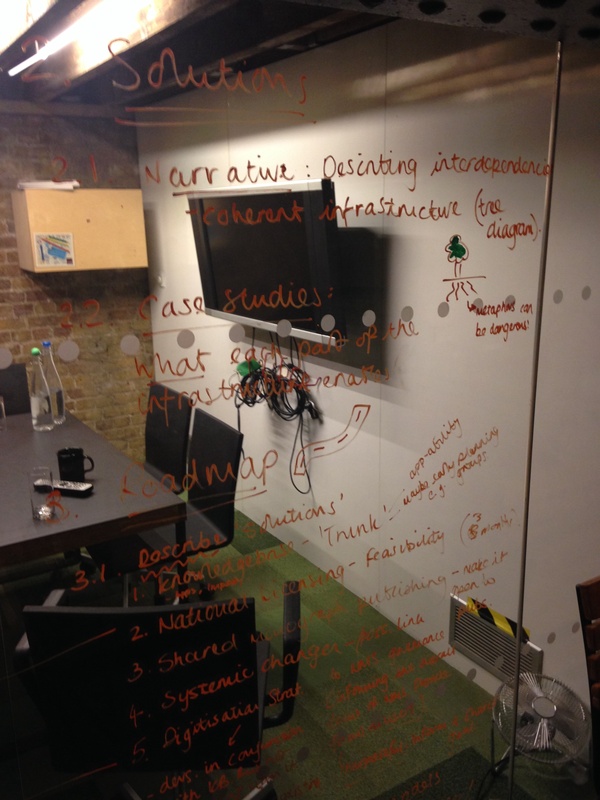 Does working in a small room, with glass walls – that you can write on – make for a better planning workshop?! I ask these questions as the project met just before Christmas with our project co-design leads: SCONUL and RLUK, who kindly gave up some of their time to help us think about, and plan, the project’s report. Collaboratively decide on main sections of the final report and sketch out content/headings in a little more detail. The meeting ended up being incredibly productive; in around half a day we’d managed to sketch out a vision for the report and the structure and outline of content. The planning workshop meant the project effectively got a lift up a couple of rungs on the report writing ladder – we sat down to do the writing with a clear structure and vision in place. So, very shortly – maybe even by the end of this month – the draft NMS report will be published. Then we want to hear from you and get your thoughts. Posted by Ben Showers on January 9, 2014 in Final Report, RLUK, SCONUL, Solutions, stakeholders and tagged Final Report, monographs, RLUK, SCONUL, Workshop. In reviewing the outputs from our last workshop and the 8 ideas that we have begun to sketch out, it became clear we had a fairly coherent set of components for a national infrastructure. Posted by Ben Showers on December 6, 2013 in monographs, Solutions and tagged monographs, Solution ideas. The project recently had its third, and final (for this stage at least), workshop. The focus of this workshop was to begin building on the ideas that have been sketched and developed so far for a shared, national approach to scholarly monographs. 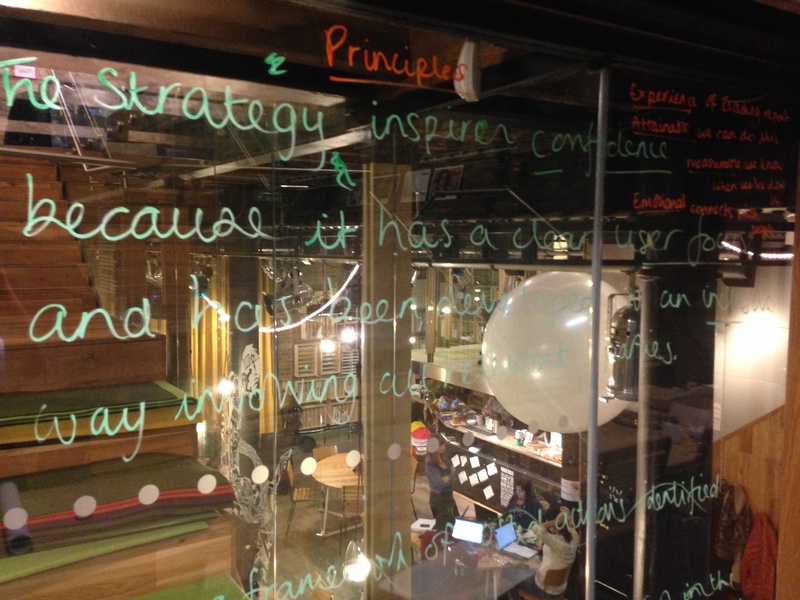 I recently wrote about the refinement of the ideas that emerged from our second workshop. We turned the 21 original ideas into 8 idea themes which we then took to the third workshop for people to build on and begin to think about key features, risks and next steps. Below are the 8 high level ideas, and some of the key features which the workshop developed (click on the idea image to read more of the detail). These are our first attempt at defining these ideas, so expect further refinement and improvement! At the very end of the post is a flip book with all the raw outputs from the workshop, which contain even more information and richness than this quick overview can provide. 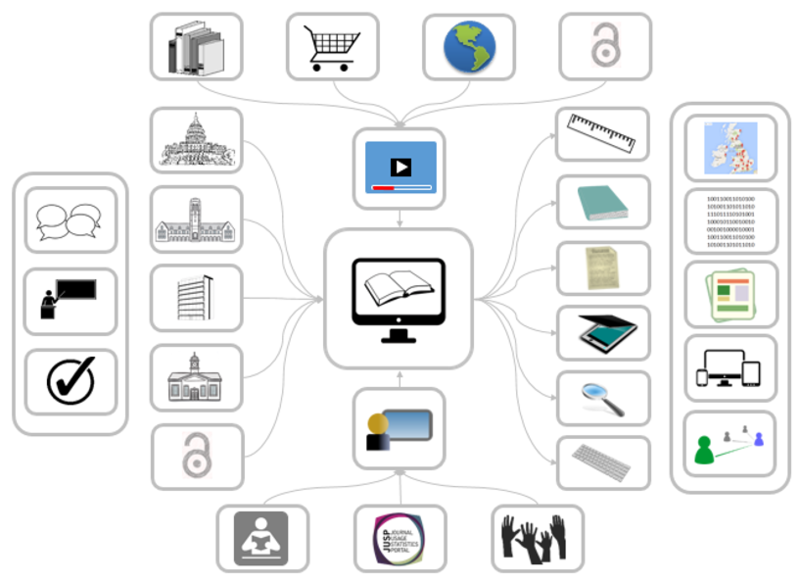 A shared monograph publishing infrastructure enabling innovative approaches to monograph publishing. Flexible dissemination: OA as standard, includes added value services, flexible pricing, multiple access modes. Academic recognition/impact: Focus on quality process and product and responsive to shifts in academic drivers (promotion) with enhanced metrics. Sustainable: Foundation is built on exploring new business models and testing what is possible. Next steps: Establish pilots (i.e., UCL Gold project; Huddersfield HOAP) to test academic buy-in, costs of new model, impact on readers/users. Also partnerships with existing publishers. Collect evidence from pilots and evaluate. A comprehensive and open bibliographic and holdings database enabling the development of new applications and services for libraries, systems vendors, publishers and users. A shared service with shared infrastructure. Membership: Go beyond libraries (museums etc). Shared collection management: Enables agreed responsibilities across sector and builds on existing tools. Enrichment: Enables the enrichment of shared metadata and innovative approaches to cataloguing. Next steps: Use Hathi Trust to ensure any proprietary data is replaced with open surrogates; Liaise with KB+, Copac etc; Explore business models; Undertake cost/benefit analysis based on stakeholder group. 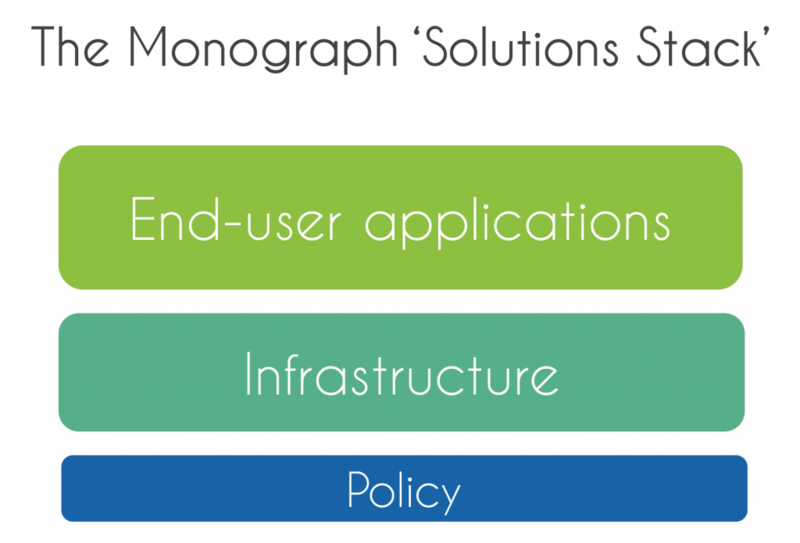 Services and applications built using the monograph knowledgebase infrastructure/data. Preservation app: Identifies rare and unique materials locally and guides preservation decisions. Features include: Alert system (Priority material for preserving/digitisation); Risk calculation (traffic light system on at risk items). Cataloguing app: Enables the collaborative enrichment of metadata and local download. Encourages crowdsourcing and innovative cataloguing models. Next steps: Establish appetite with libraries, vendors, publishers and users. Dependency on knowledgebase development. A high-level, ‘think tank’ providing a systematic view across the disparate parts of the scholarly comms/monograph landscape. Credible: The right stakeholders with authority (includes some ‘disruptors’). Holistic: Overview and communication between otherwise disparate areas. Managed (Curated): Facilitated, iterative, funded by members, time-limited membership. 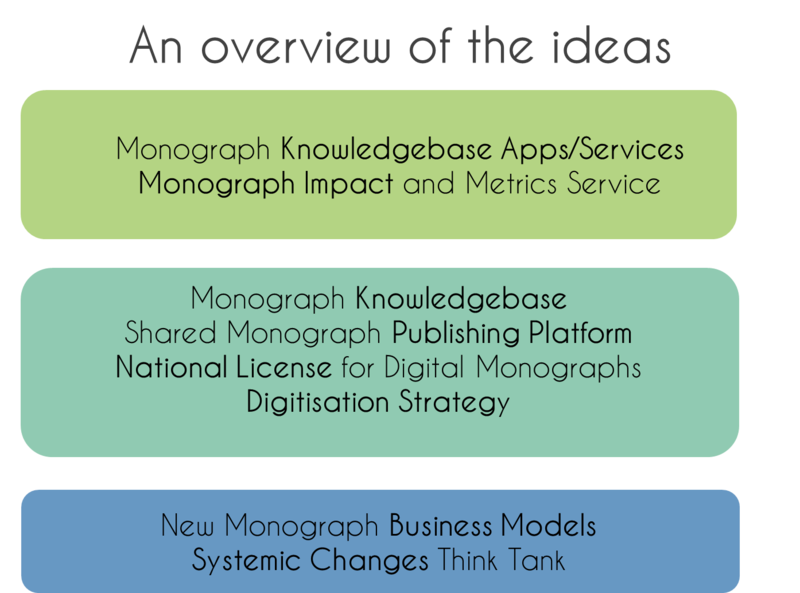 Establishing the criteria and potential for new monograph publishing business models. Maximise Impact/reach: Focus on social responsibility and making public funded research available to public. 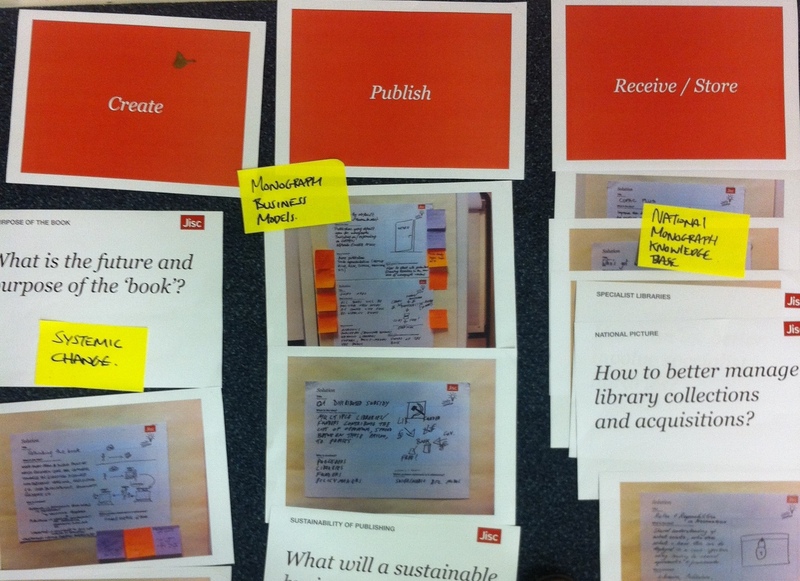 Sustainable: Develop business models for open access. Value for money: Delivers value to the stakeholders involved. Next steps: Assess outcomes of current work in this area (e.g., Knowledge Unlatched); explore the actual demand for monographs (maybe the model doesn’t work for a reason – maybe we just need print on demand). 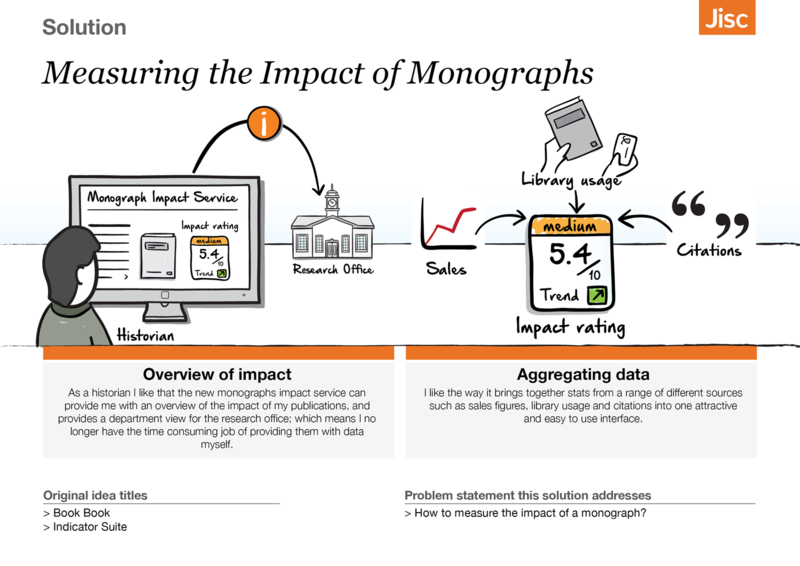 Building on the monograph knowledgebase this application enables researchers, libraries and publishers to track and manage the impact of their monograph to provide new insights, track influence and inform purchasing. Neutral: ‘The Switzerland of publishing’! Non-commercial, collaborative, no defining metric. Open: Available to all, includes variety of data and allows re-use of data. Learning: Is open about its limitations and seeks to improve its understanding of users. Next steps: Review feasibility (explore current data sets, find gaps etc); Test user appetite; undertake small scale pilot. A national strategy that: Creates an infrastructure/services; Sources and secures funding; Has a national collection management approach; Undertakes analysis and prioritises collections. Consult publishers: Work with Jisc collections and consult with a variety of publishers on business models etc. Public/Private: Explore models for public/private partnerships. Strategy: Focuses on de-duplication of local effort. Next steps: Establish scope of current digitisation corpus; begin discussions with funders; work with spotlight on digital (gap analysis) and other work in this area; test partnerships with vendors. Next steps: Possibility of holding a workshop to address this area, with Jisc Collections and other relevant stakeholders. The above is my attempt to try and reduce some of the rich ideas and thinking that emerged from our final workshop. So, if you’d like to read more of the detail that surrounds these ideas then take a look at the flip book below. Posted by Ben Showers on December 6, 2013 in collection management, digitisation, monographs, preservation, Solutions. This is the second post in a series which explores the National Monographs Strategy project principles in some detail. My colleague Ben Showers described the principles in brief in an earlier post. Realising benefits is our sixth principle, but as you will see it is closely related to some of the other principles. The suggestion there is that we can identify and make real a set of interrelated advantages which arise from change activities conducted as part of the programme. With MSP benefits are developed as part of a detailed business case and a Business Change Manger (or a number of these) is responsible for defining the benefits for particular business unit which is undergoing radical change. Within the confines of a commercial company, or of a public institution, it is challenging to define benefits, but it is at least clear that something needs to change from the outset. A programme also has a set of objectives which help in steering its benefits definition activities. In such situations the business case and all its related documentation acts to centralise all the activities which will ultimately lead to benefits. The NMS project is not at all like this. The project spans multiple institutions and complex UK wide systems; it also seeks to identify national and local solutions. It is being conducted at a time of massive disruptive change within the monograph landscape, so defining measurable benefits is challenging. To devise benefits which will serve multiple stakeholders across a fragmented landscape, we have decided to take a design led approach and are working in a fairly agile way. Central to this approach are the stakeholders. Our approach has been to engage in very real ways with these groups, through events, blogs and Twitter to ensure a thorough examination of the issues relating to monograph management and delivery. Firstly, we have had to define what the actual problem is with the Monograph. We attempted to define this during a really engaging workshop with a group of Librarians, Service Mangers and Academics. Secondly, now that we have understood the problems, we are starting to shape some tentative solutions. Thirdly we will need to produce a cogent set of recommendations. The idea is to have done the preparatory work for a strategy during phase one, which we will then fully develop in phase two. In effect this phase is all about capturing requirements and understanding the needs of our stakeholders. Understanding these two things is central to defining benefits. Once the strategy is in place we hope to have a clear articulation of the envisaged benefits. We will have achieved this by building benefits thinking into the process from the start. By being ‘open’ we are engaging with a wide group of stakeholders. Having identified these groups of fellow travellers we are envisaging together what the ideal change will look like for them. We will then need to identify measures to ensure the benefits. We will agree these with our co-design partners and the wider community ensuring they are actually achievable, and can be evidenced and tracked. Obviously the benefits won’t only accrue to those we are working directly with, academic librarians, but we hope this initiative will change the way the sector delivers benefits to its large stakeholder groups; students, researcher and the wider society. The data we are gathering as part of the current phase will help us to draw a baseline which is a key part of measuring change and to establishing if a benefit has been achieved; so we are being ‘evidence based’ from the outset. Being open also helps use to share our learning with our stakeholders throughout the project and to gain continuous feedback. This should, we hope, result in the benefits being owned by the community, hence the principle ‘community led’. By approaching this project with a co-design methodology, a design thinking approach, and with agile overtones we have benefits sitting right at the heart of things, something we hope will result in really impactful change for the sector and the recipients of its services. Ultimately to realise benefits we will have to actually do something, and at the moment we are working with our stakeholders to sketch out some prioritised recommendations which we hope to pilot and prototype over the coming year. 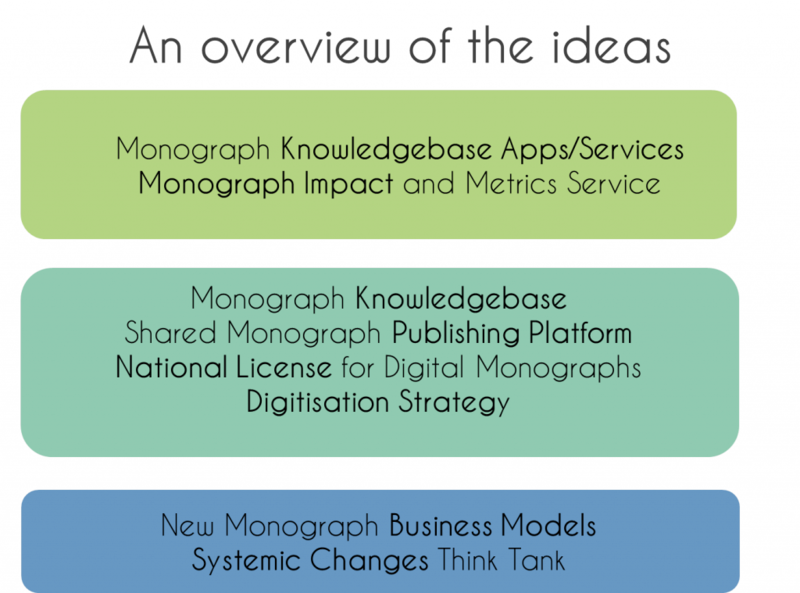 This work will inform our vision, the strategic aims and finally result in a roadmap for a new approach to the management of monographs. Posted by Peter Findlay on November 22, 2013 in collection management, monographs, principles, problems, stakeholders, Uncategorized. 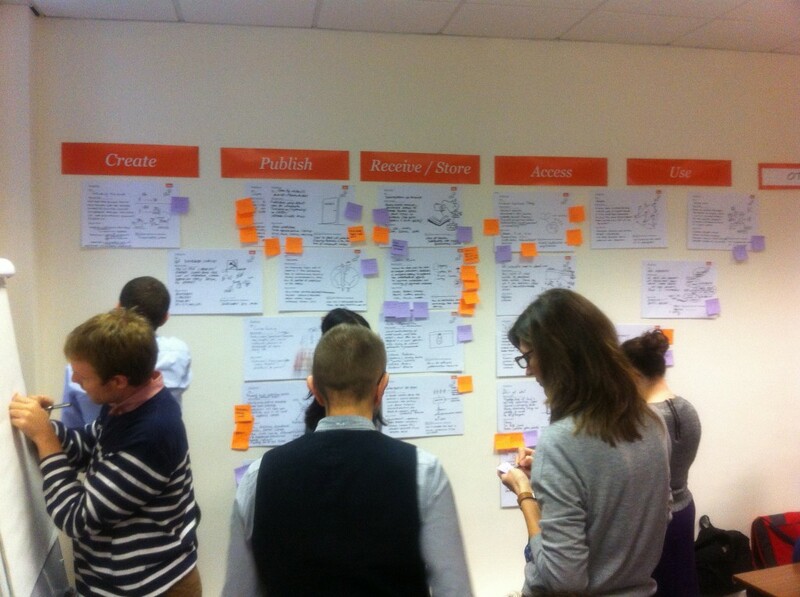 The NMS project team recently got together to ‘crunch’ some of the outputs from our recent workshop exploring solutions. We got together to plan the next workshop where we want to build on the outputs of the last two workshops, developing the outline solutions further, and making sure we answer the problem statements that emerged from out first workshop. 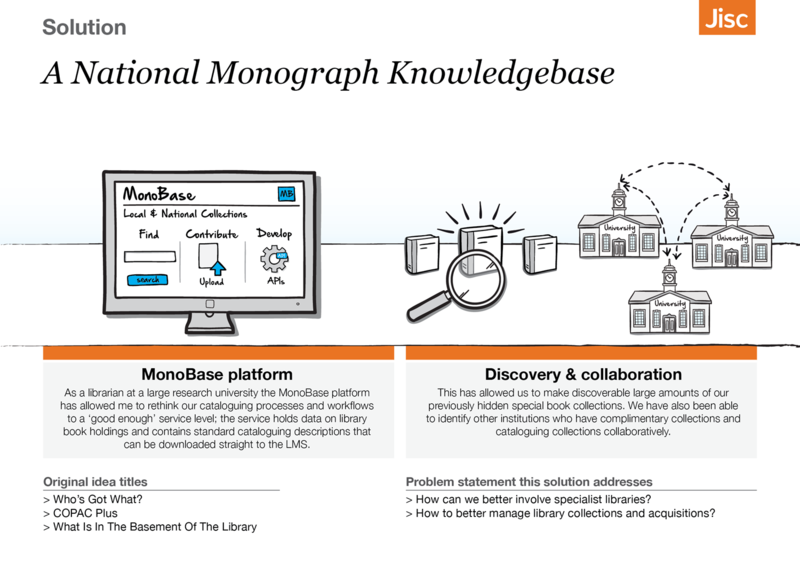 As a librarian at a large research university the MonoBase platform has allowed me to rethink our cataloguing processes and workflows to a ‘good enough’ service level; the service holds data on library book holdings and contains standard cataloguing descriptions that can be downloaded straight to the LMS. This has allowed us to make discoverable large amounts of our previously hidden special book collections. We have also been able to identify other institutions who have complimentary collections and cataloguing collections collaboratively. As a librarian at a large research university I have been able to work with developers to build a preservation app using the data stored in the Monobase website. This preservation app helps us identify where to allocate our preservation resources by giving as an at risk rating for every item we own. 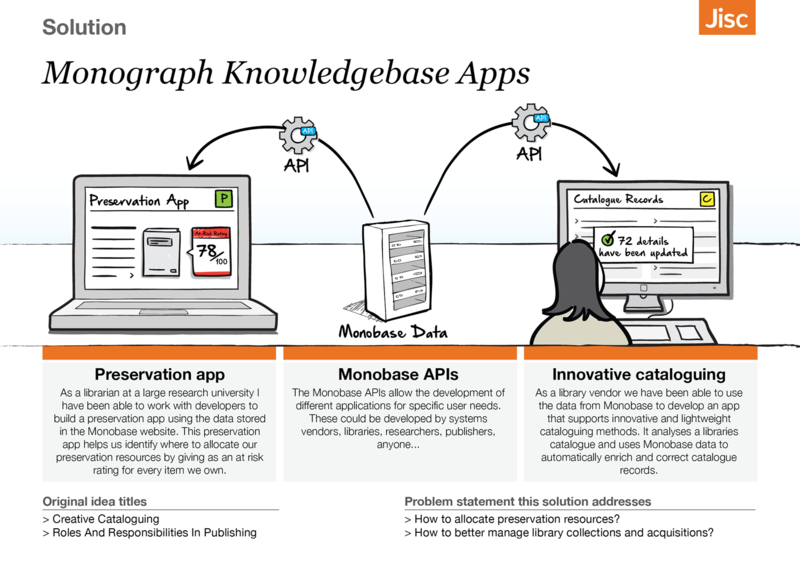 As a library vendor we have been able to use the data from Monobase to develop an app that supports innovative and lightweight cataloguing methods. It analyses a libraries catalogue and uses Monobase data to automatically enrich and correct catalogue records. As a librarian at a large research intensive university the national digitisation strategy has enabled us to work with a number of local institutions to digitise and make openly available online a previously hidden collection of unique books. It has resulted in a new research group being established at my university, and we’re currently working with a number of institutions nationally to concentrate on a larger and more diverse collection of materials that has been identified by academics as of the highest research importance. As a historian I like that the new monographs impact service can provide me with an overview of the impact of my publications, and provides a department view for the research office; which means I no longer have the time consuming job of providing them with data myself. I like the way it brings together stats from a range of different sources such as sales figures, library usage and citations into one attractive and easy to use interface. 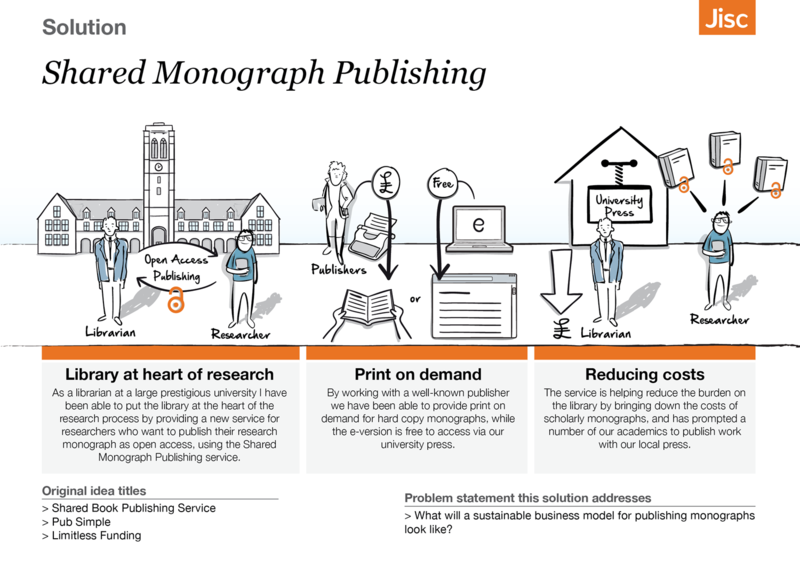 As a librarian at a large prestigious university I have been able to put the library at the heart of the research process by providing a new service for researchers who want to publish their research monograph as open access, using the shared monograph publishing service. By working with a well-known publisher we have been able to provide print on demand for hard copy monographs, while the e-version is free to access via our university press. The service is helping reduce the burden on the library by bringing down the costs of scholarly monographs, and has prompted a number of our academics to publish work with our local press. As a librarian in a teaching intensive university the national monographs license has resulted in improved NSS scores for my library due to improved access to digital monographs and ebooks, and my book budget hasn’t increased at all. Also, I have been able to focus on improving student experience further by reallocating staff time onto new services and front-facing roles. As a librarian at a large research library I am concerned that new technologies and changing user behaviour are presenting challenges to the way we approach the creation, publication and use of monographs. 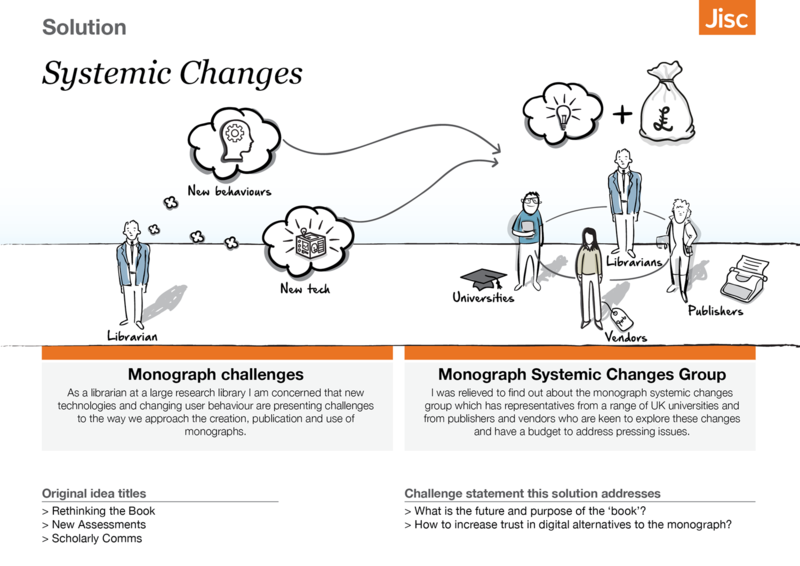 I was relieved to find out about the monograph systemic changes group which has representatives from a range of UK universities and from publishers and vendors who are keen to explore these changes and have a budget to address pressing issues. Already these ideas begin to offer up some very interesting possibilities. A focus on data, which would provide a foundation for various services to be built and existing services and systems enhanced. New cataloguing approaches might be developed (crowdsourcing catalogue data?) and services could be plugged in and turned off as user requirements evolve and technologies change. What’s also interesting is that some of these ideas might also help provide a basis for some of the more systemic changes that had been described in the workshops too, such as the future and purpose of the book form, for example. Ideas such as shared or collaborative publishing and a national, collective approach to digital monograph licensing, seem to lay foundations for more radical action around the monograph and its digital future. So, from the original 20 ideas we managed to get these 7 idea areas – which will be the starting point for the next workshop. The aim of this final workshop is to build upon the solutions work in the last meeting and begin to really flesh out some of these ideas. What the top features of the idea might be? Impact of the idea on stakeholders (like publishers, librarians, students and academics), both positive and negative? What success might look like? Which aspects of the idea you’d want to test and pilot? The workshop will provide the project with both ideas that could be piloted and tested in future phases, as well as provide the requirements for potential solutions, and give us the basis for our final report and a vision for what a National Monographs Strategy could help libraries, publishers and academics achieve. We’ll be posting the outputs from the workshop shortly after its finished (after Tuesday 26th November) and would love to get your feedback and thoughts on what ideas and potential solutions might be appropriate for the problems presented by the monograph. Posted by Ben Showers on November 20, 2013 in monographs, Solutions. If September was a month for contemplating, and getting under the skin of problems, then October was a month for reveling in the possibility of solutions: Of ideas. The second NMS workshop focused on beginning to sketch out potential solutions to some of the problem statements that had been developed and refined in the September workshop. This workshop really was a chance for the expert group and participants to explore the potential and existing solutions to some of the challenges and problem statements that had been surfaced in our earlier meeting. Whereas the problems are, to a large extent, known and well rehearsed, the potential solutions and ideas for addressing them could be as unusual and innovative as people dared be! We began the day by reviewing the problem statements that had been developed in the previous workshop (see above), and participants then selected particular problems to work on in small teams. These teams began by completing ‘what if…?’ cards to help get the creative juices flowing. These statements then helped the groups develop a series of solution outlines which detailed the idea, stated who would be involved and what problem it addressed – they also included a picture! Participants voted at the end too: Purple for how feasible it was; Orange for the best idea. Rather than list all the solutions, I have created another flip book with all the ideas developed on the day. Take a look and let us know what you think. So, you can see the ideas for potential solutions that emerged from the workshop. 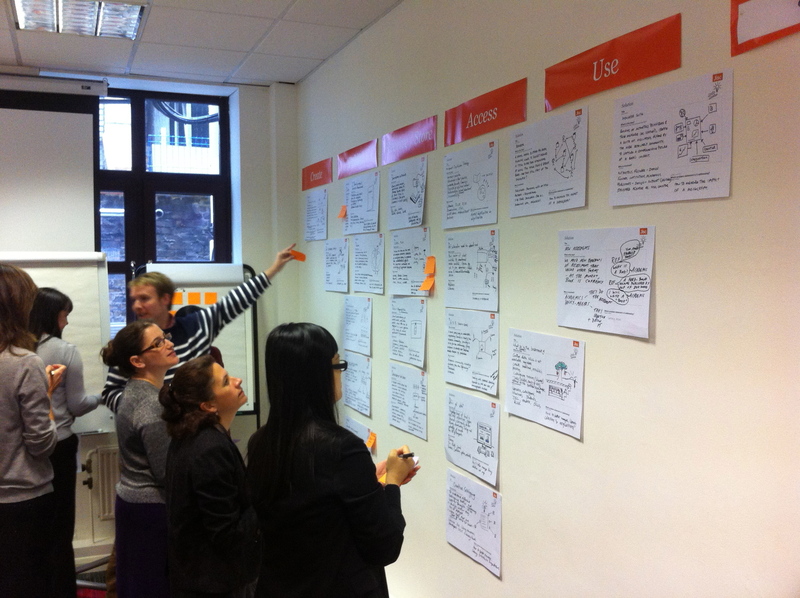 We can’t hope to cover every possible idea or solution in a workshop, so getting your input is essential. What we’d love to know is what ideas you’ve got, or which blindingly obvious solution have we completely overlooked? I’ll be adding the solutions to Ideascale soon – so you’ll be able to vote on them too. Let us know what we’ve missed, or the idea you’ve had bubbling away in the back of your head. Remember: This isn’t the end of our solutions hunting; nor even the beginning of the end; but merely the start of the beginning! 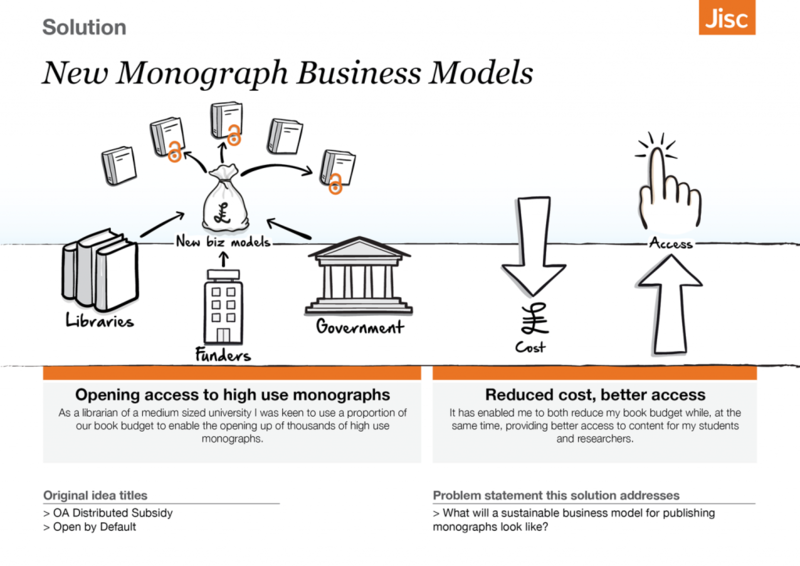 Posted by Ben Showers on November 7, 2013 in Solutions, stakeholders and tagged monographs, Solution ideas, Workshop.